Money is a terrible motivator. If I were to say to you, “Reader, I’d like you to come up with a creative way of solving this problem we have,” or “I’d like you to complete this complex task requiring somewhat sophisticated cognitive abilities,” you’d actually perform worse if I offered you a nice chunk of change as a reward. Seem backwards? It should, because we’re quite conditioned to think about motivation in terms of linear, easily explainable rewards and punishments (see what I did there?). Classical and operant conditioning form the bedrock of behavioural psychology, and between them explain a whole lot about motivation and learning. Classical conditioning, most widely known by the famous “Pavlov’s dog” example, tells us that we can create a new response to a stimulus merely by pairing that stimulus with another one a whole bunch of times. As a result, we can train dogs to salivate at the sound of a bell by ringing a bell every time we give them food for a few weeks. Meanwhile, Skinner’s operant conditioning explains motivation in terms of reward and punishment. If I want to create more of a certain behaviour, I should therefore offer a reward after every instance of that behaviour, reinforcing it. Similarly, if I want to decrease the frequency of a behaviour I can pair it with a punishment, which by all reasonable logic should decrease and hopefully extinguish the behaviour in question. A good knowledge of these basic theories of behavioural psychology allows us to do some pretty amazing things: train animals, explain and treat phobias, make all sorts of laboratory rats do all sorts of crazy things, and the list goes on. But when it comes to human motivation, the aforementioned theories are about as helpful as an umbrella in a snowstorm. People try to use them, but they don’t really end up accomplishing anything useful. At least, this is what I learned when I participated a few days ago in a webinar by Daniel Pink, bestselling author of the book Drive: The Surprising Truth About What Motivates Us (not to mention one of my favourite-ever career books – The Adventures of Johnny Bunko). Pink talked for about an hour about his book and the decades of motivation research that he delved into to write it. The webinar itself was divided into two main topics: why our thinking about motivation is upside down; and what people and organizations can do to increase motivation as a result. The thrust of the former statement goes something like this: Money only effectively motivates us in the performance of simple, mechanical tasks requiring little cognitive activity. So, if I was assembling something rudimentary on a production line, or stuffing envelopes, or something similar, larger monetary rewards would indeed give me motivation to work harder and be more productive. But when we’re asked to perform tasks requiring even rudimentary cognitive abilities, it turns out that money doesn’t really motivate us at all. In fact, it can even decrease our motivation. So what motivates us to perform better at complex tasks? Pink gave three answers: autonomy, mastery, and purpose. Self-direction (autonomy) naturally increases intrinsic motivation, as does the feeling that you actually know what you’re doing and that you can do it well (mastery). Most motivating of all, though? Knowing why you’re doing something, and feeling that what you’re doing is therefore meaningful (purpose). To put these three findings about motivation into practice, Pink suggested some pretty neat resources and tips. The first is a kind of autonomy self-assessment: from 1-10, how much control do you have over 1) what you do, 2) how you do it, 3) when and where you do it, and 4) who you do it with? If you add up the numbers and the total is less than 27, Pink says that you’re in trouble. Similarly, if you score high in some areas but disproportionately low in one, you’re not doing well enough. Other ideas to increase autonomy (that are currently being used by real companies) include what Pink termed “Fedex days”: entire days where employees can work on anything they want, and then they present their ideas and work to the team the next day (Why Fedex days? Employees have to “deliver overnight”). Alternatively, companies can have regular Genius Hours, wherein employees can work on whatever they want, however they want, for that hour. On the topic of purpose, Pink suggested doing a quick feedback activity on why activities are being done, or why companies even exist. This could involve having employees write on a cue card what they believe the mission of their company, department, etc. actually is. If you get a bunch of blank cards, you know you’re in trouble. 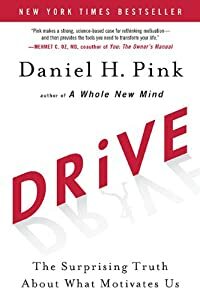 Ultimately, Pink only scratched the surface of the work he’s done studying and writing about motivation. For anyone who’s interested in learning more, I’d strongly encourage reading his book. This should make a lot of employers happy, since it could potentially save them a lot of money. I suppose so! I forgot to mention, however, that Pink also found that a kind of baseline compensation was also necessary. People become incredibly de-motivated when they perceive a situation as unfair.